Many consumers loved the fact that there was a wide-width option. The mesh material on the upper was appreciated because it conformed nicely to the shape and movement capacity of the foot. Several testers appreciated the flexibility of the underfoot platform. The cushioning system gave adequate support and shock dispersion, some runners noted. Most of the people who have tried the Under Armour Micro G Pursuit were happy with its design and color schemes. The weight of this running shoe was deemed sufficiently light for all-day wear. The fabric near the toe area ripped apart after only a few uses, a purchaser complained. A few runners observed that the colorways of the actual product didn’t match the photos on the website. People were generally happy with the Under Armour Micro G Pursuit. They welcomed its appealing silhouette, its multiple width options, its flexible underfoot platform, and the comfortable midsole. It’s perceived as an agreeable neutral shoe for the roads. Contrariwise, the durability of the upper was considered questionable, and the color schemes were deliberated as misleading. If you are seeking a minimalist design shoe that is a no-frills model, is lightweight and reasonably priced, look no further than the Under Armour Micro G Pursuit. This shoe is so comfortable that I am using it for my everyday shoe. I was seeking a shoe that is lightweight, comfortable and provided good support. This shoe has all of that and much more. I am traveling to Kenya soon and this is the shoe I will be using for everyday use while there. Let’s check out some of the other features of this shoe. The upper features a lightweight mesh material which appeals to most people as it conforms well to the shape and movement of the foot. There are ventilation pores that allow for good air flow into the foot chamber. The tongue could be a bit thicker on this model when compared with other running models I have tested. This is a great shoe for those requiring a wider size. I use a 4E and found the toe box to be just right without being too wide. This provides a very comfortable fit. The midsole is a single unit constructed of Micro G foam. Its purpose is to provide a cushion for the foot-landings and assist in the push-offs. In addition, a sock liner made of ethylene vinyl acetate is placed above the primary midsole which provides more cushioning for the underfoot. This all makes for a very comfortable and well-cushioned footfall while running. I use an after-market insert made by Sof-Sole in all my shoes and found the factory insert on this shoe to really be unacceptable. You can see from the enclosed pictures that they are paper thin and offer no support at all. The outsole of this shoe uses a full-length rubber layer which the company states, “mimics the shape of car tires” with elongated lugs. The grooves between the lugs act as flexion points that support the natural bend of the wearer’s foot. There was also a complaint regarding the shoe squeaking after some use. I have not experienced that issue. The price for this shoe is very competitive and is normally just under $100. However, this is the season for sales and I secured mine for $60. For the money you’ll spend, the Micro G Pursuit is a good quality buy. There was a comment I read regarding the size running a bit small. However, I wear a 9.5 4E and found it to fit very well, so no complaints here on that issue. 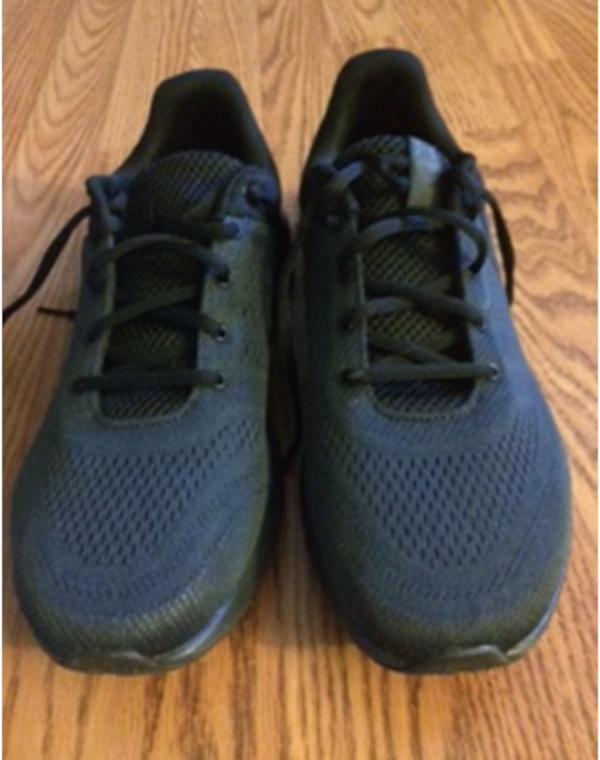 For runners, this shoe is a neutral shoe. They are not designed to be a stability shoe or for motion control and they are not a trail shoe as I don’t feel they were designed to withstand the abuse of a trail type use. If you are seeking a balance of flexibility and excellent cushioning, I encourage you to check out this shoe. The underfoot platform is quite comfortable as well as flexible. Some comparable shoes to the Micro G Pursuit are Asics Fuze X Adapt and Knit models, Nike Free RN and the New Balance Fresh Foam. I am confident that this shoe would meet the needs of a person looking for a very comfortable, reliable everyday shoe or for a runner who races on the road. It is not a trail shoe as it is not constructed for that purpose and I don’t feel it would hold up well. I also don’t feel it would serve a person well that has pronation issues. Overall, I feel this shoe holds its own with other similar models and lives up to the reputation of Under Armour products. The Under Armour Micro G Pursuit is a neutral running shoe that’s designed for flat surfaces such as the asphalt and groomed off-road paths. It features a minimalist design that caters to casual shoe enthusiasts and those who don’t want a lot of bells and whistles on the upper. Mesh with lots of ventilation pores hugs the foot and keeps it dry. A one-piece midsole foam carries the foot and keeps it cushioned throughout the running session. The proprietary compound used for this model is meant to attenuate shock and energize the takeoffs. A rubber layer protects the platform from abrasion. The design of the outsole has been taken from vehicle tires, with indentations and horizontal patterns to heighten surface grip. The Under Armour Micro G Pursuit has a standard running shoe length. It’s designed to accommodate the inclinations of consumers when it comes to size. The width profiles for the women’s version are B – Medium and D – Wide while the men’s iteration has the D – Medium and 4E – Extra Wide options. Aside from this shoe, Under Armour also offers some running shoes for wide feet. The outsole unit of this Under Armour running shoe makes use of a full-length rubber layer. It protects the foam midsole from the abrasive nature of the surfaces. Moreover, it’s designed to mimic the shape of car tires, with horizontally elongated lugs and traction dots on the periphery. Grooves between the tire-like lugs act as flexion points that enable the natural bending capacity of the wearer’s foot. The midsole features the Micro G® foam, which is a single unit that serves as the bulk of the cushioning system. Its purpose is to cushion the foot-landings and energize the toe-offs. The Micro G foam is also used in the UA Assert 7 running shoe. A sock liner made of ethylene vinyl acetate is placed above the primary midsole unit. It adds some more cushioning for the underfoot. Moreover, the arch area has been raised to allow it to support the wearer’s midfoot. Mesh is used for the upper unit of the Under Armour Micro G Pursuit. It is soft, flexible and it has ventilation pores that encourage airflow into the foot-chamber. It’s configured to maintain a lightweight disposition. The tongue and collar are padded. These parts of the façade help in holding the foot in place and preventing it from exiting the interior chamber unexpectedly. The traditional lacing system helps in providing a secure yet customizable fit. Extra eyelets on the front of the collar give the option to pull in the back part of the upper for a snugger heel-and-ankle coverage.